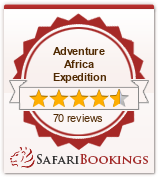 Kenya 8 Days Kenya Lodge-Camping Safari is Luxury Kenya Safari, The 8 Days Tour covers Kenyan 7 best National Parks. 4 Days Masai Mara, Lake Nakuru 1 day and 3 Day Samburu-1 Day Treetop Mount Kenya. The 8 days Kenya Lodge Safari starts by pick from your hotel after the breakfast at around 0730am, then depart for the Masai Mara Game Reserve, stopping at the viewpoint of the Great Rift Valley and at Narok town for hot lunch in Narok Town. After lunch proceed on to Masai Mara for the next 2 hours or so. Arrive in time for a late afternoon game drive in this park, which is essentially the northern extension of Tanzania's Serengeti National Park as an artificial border only separates the two. Masai Mara is renowned for its high animal concentration and abundance. Black-manned lions, elephants and buffalo can be seen (3 out of the big 5) though luck is essential for spotting leopard and rhino, which make the other two. The reserve is essentially the northern extension of Tanzania �s Serengeti National Park and is home to numerous plains game including the migratory wildebeest, the common zebra and the Masai giraffe as well as antelopes like Thompson�s gazelle, hartebeest, impala and Dik Dik among others Dinner and overnight will at the Lodge. The afternoon game drive which takes you until 1830hrs, return to the Mara Sopa Lodge for dinner and overnight. Wake up call at 0600hrs,proceed for the early game drive which takes you until around 0930hrs return to the Lodge for main breakfast,then check out the Lodge as you proceed to Lake Nakuru for Lunch.Arrive in Lake Nakuru late afternoon proceed for the game drive until 1830hrs.This lake provides the best scenic for the white Rhinos as well as Flamingos. Lake Nakuru National Park, where you will have a chance to visit a unique sanctuary catering for a size able number of the endangered rhinoceros and the Rothschild giraffe. Water-bucks as well as the predators such as the lion and leopard are common at the park. Also to be seen is a myriad different variety of bird-life in and around the lake. Flamingo's are also plenty at the lake. Dinner and overnight in the Lake Nakuru Lodge. Samburu National Reserve is a wildlife haven. Here you will spot Africa's big cats - lions, cheetahs and the elusive leopard. Some animals are unique to this northern Kenya Park: Grevy's zebra, reticulated giraffe, kudu and gerenuk. The Ewaso Nyiro River, the boundary with the neighboring Buffalo Springs National Reserve, is where the elephants, buffalo and other animal species gather for a drink. You will find the scenic semiarid landscape quite dramatic. The reserve is located within the lands of the colorful semi-nomadic Samburu tribesmen. Dinner and overnight at a campsite.